This DIY guide includes everything a beginner needs to start making their own zines. 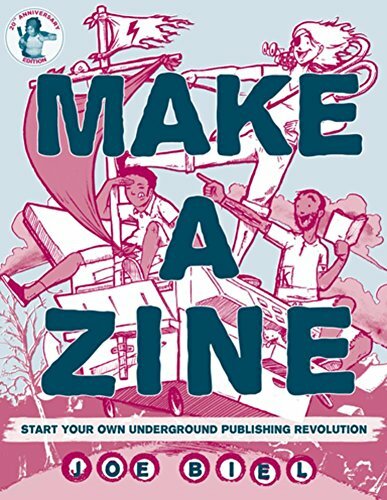 “Make a Zine” also covers more advanced topics, like legality and distribution methods. Author Joe Biel consults with several fellow zine creators and artists throughout this guide, giving readers insight into a variety of different zines. Both his and his contributors’ enthusiasm for their craft is infectious. It can make anybody want to pick up a pencil or sit down at their computer to start brainstorming ideas. Creating an entire publication, regardless of the size, can seem like a daunting task. This book breaks it down into eight easy steps, and then goes on to discuss different ways to complete those steps and available tools and techniques in detail. With this guidance, what used to seem like an insurmountable amount of work becomes a fun and easily managed project. With tips on everything from which paper to use, printing the final product, and book binding to keeping mailing lists and handling postage, new zinesters have plenty of wisdom to draw on. One of the reasons “Make a Zine” stand out is its focus on sales and marketing. A lot of guidebooks on creative pursuits neglect this area. Reading practical advice from people directly involved in the zine community is both encouraging and inspiring. It’s nice being given some ideas of what to do with a finished piece of work. I also enjoyed learning about the different distribution methods available to self-publishers, in particular. A lot of these tips can also be applied to larger projects. The authors also include resource lists for anyone interested in going more in-depth. Digital zine libraries, other recommended readings, and even a list of excellent offset printers are provided for readers. “Make a Zine” is an entertaining and informative introduction to a wonderfully diverse and passionate community. Anyone can start one of their own on any topic, but this book’s guidance can make the entire process easier. Anyone interested in learning a little more about how their favorite zines are created should check it out. For creators and readers alike, “Make a Zine” by Joe Biel offers insight into an entire underground community.